Back in March I posted a photo essay of the SteamRanger historic railway featuring photos of the largest of the steam engines currently in service, the Duke of Edinburgh. You can find that post here. 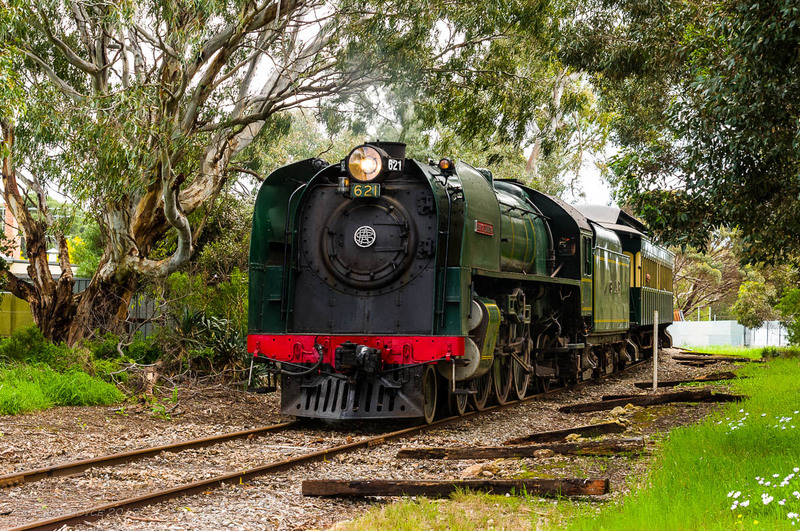 SteamRanger is a volunteer run society operating a number of tourist railway services on the now isolated Mt Barker to Victor Harbor broad gauge line. 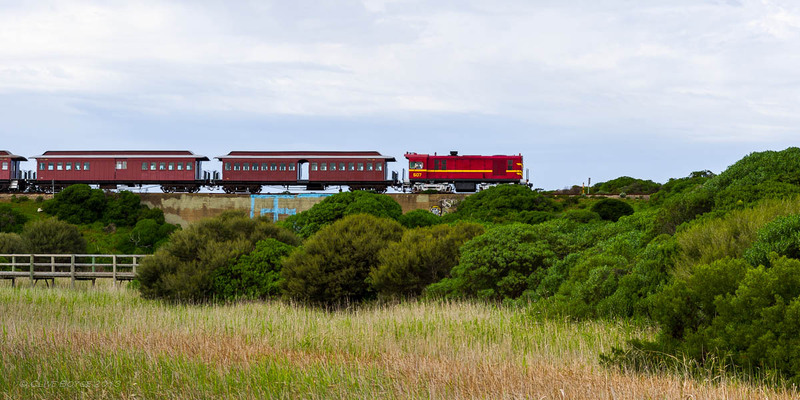 The Cockle Train service runs along the Goolwa to Victor Harbor section of the track, along the edge of the Southern Ocean, for a distance of around 12 miles. Cockles, a local shellfish prolific near the mouth of the Murray River, provide the name for this service that runs regularly on weekends and school holidays. 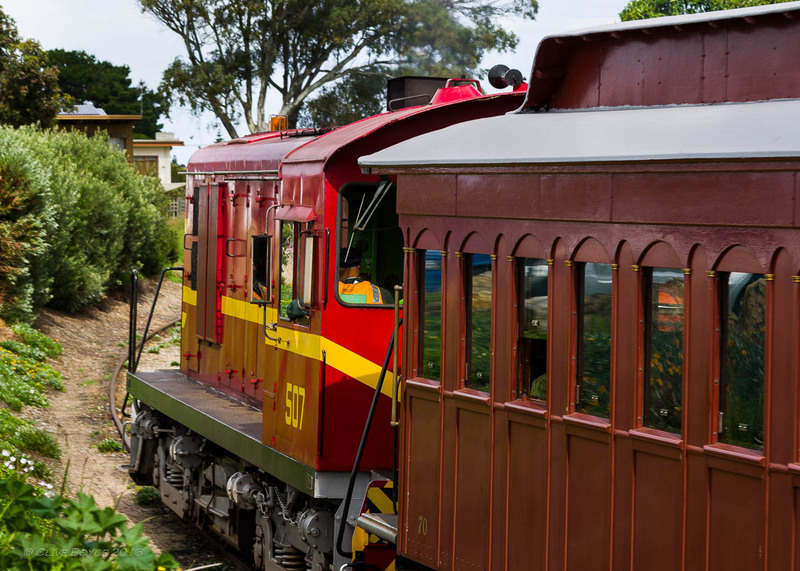 This section of line is the oldest in South Australia and was established in 1854 as a horse drawn railway to move freight from Goolwa (the lowest river port on the Murray-Darling river system) to nearby ocean ports (initially Port Elliott and later Victor Harbor). The railway allowed the mouth of the Murray River to be bypassed as it was unsafe for navigation, being shallow and directly facing the treacherous Southern Ocean swell. The line was rebuilt for steam in 1856. A number of different rolling stock units are used to operate the service. 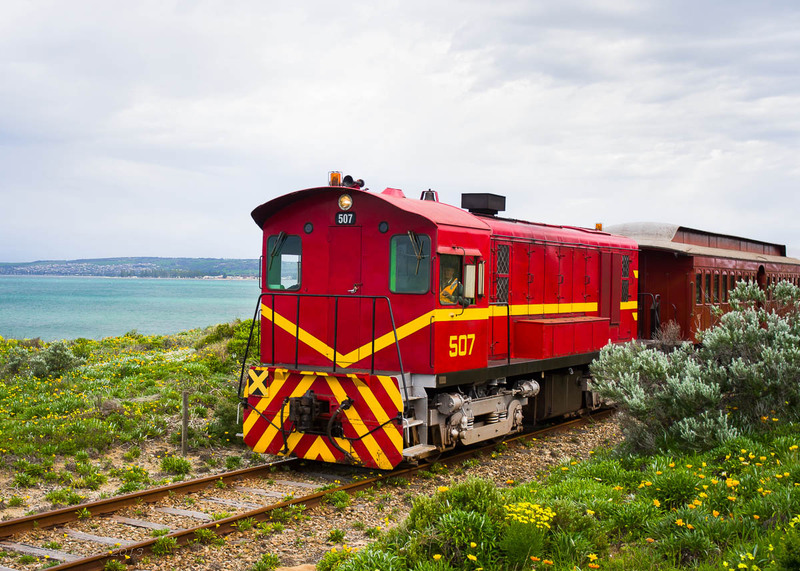 Last weekend I drove down to Goolwa and followed the Sunday morning train from Goolwa to Victor Harbor and back. 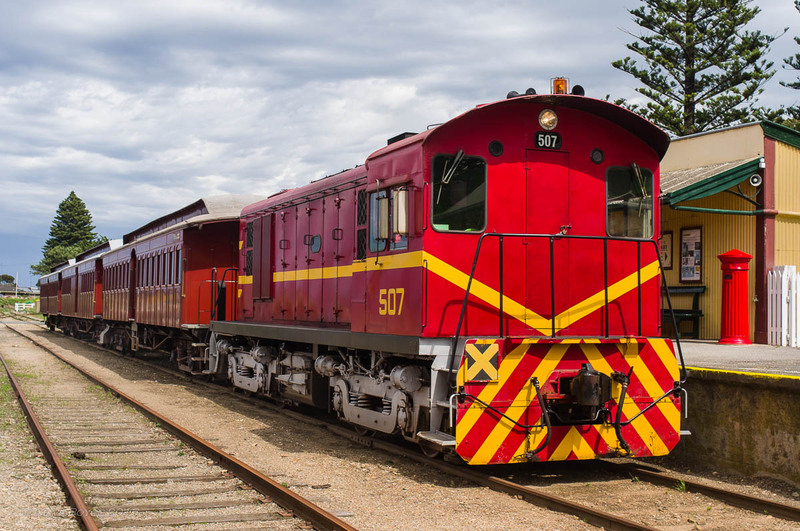 This service was operated by a former South Australian Railways 500 class diesel locomotive, No 507. 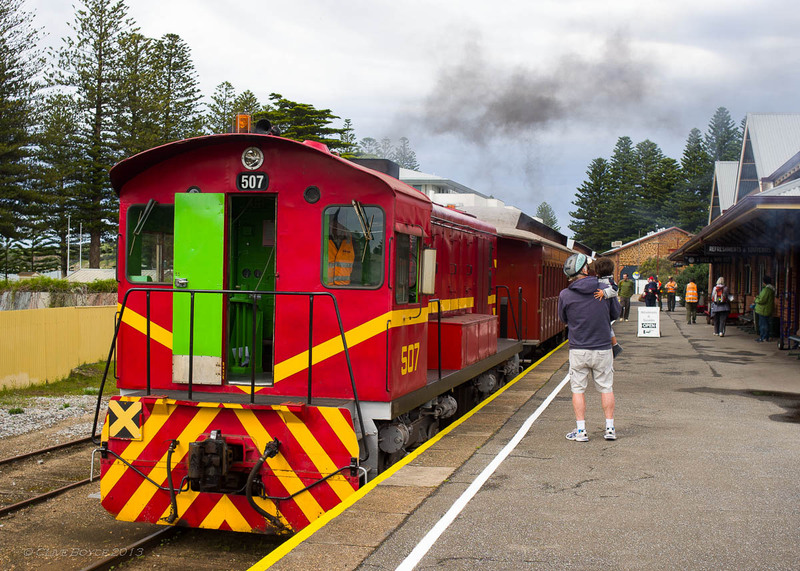 The 500 class was introduced in the 1960’s as shunters in marshalling yards across the State, replacing steam locomotives used to that time. Ultimately, as trains became longer and heavier, they became obsolete. 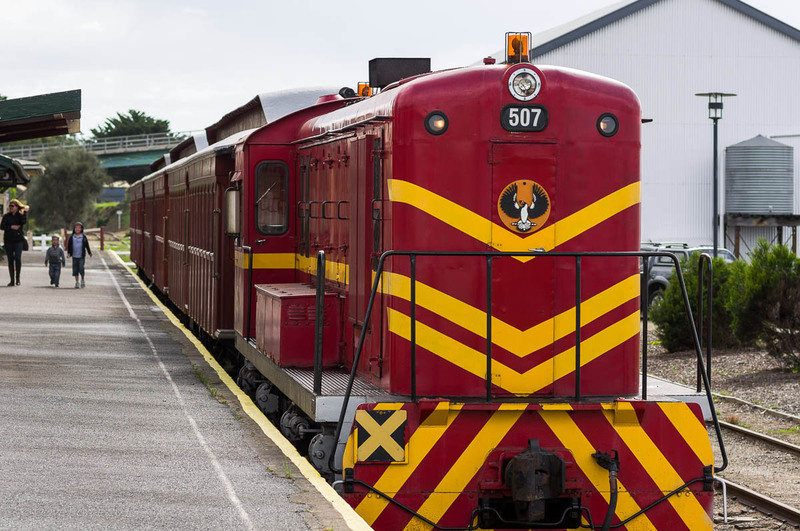 Most were scrapped in the 1990’s, but a few remain in service. I can recall seeing these locos working in Adelaide’s Mile End good yards in the 1960’s and 70’s, along with the last few steam tank engines. The 500 class was built locally at South Australian Railways’ Islington workshop. They were diesel-electric with English Electric 500hp motors, and a mix of standard and broad gauge examples were produced. SteamRanger uses No 507 to run the the Cockle Train on quieter services where the cost of running steam is too high. 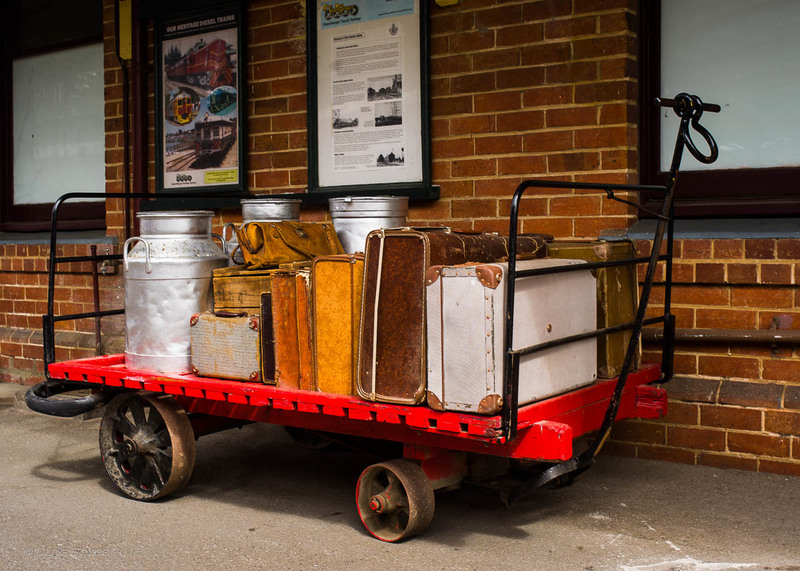 We commence the pictures at Goolwa station shortly before the train set off for Victor Harbor. Ready to go. The 500 class features a single cab design, and can be run either forward or backwards. On the trip out of Goolwa, the loco was run rear first. Visibility running this way is limited to two small windows, one each side of the engine cowling. Going round the bend! The driver on the left has no visibility at all and relies on the assistant in the right hand seat for information. Crossing the culvert bridge between Port Elliott and Victor Harbor. The Southern Ocean beach is directly behind the train. 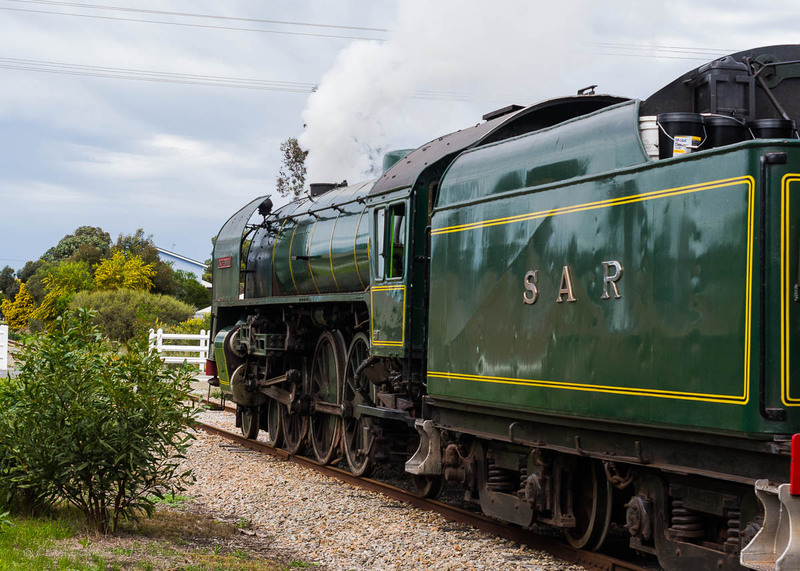 After arriving at Victor Harbor station, 507 is run to the other end of the train and hitched up, ready for the return journey. There is most likely the genesis of a “When I grow up, I want to be a train driver” conversation occurring on the platform. Some period pieces have been added to the station platform. Smoky old things on start up and also on cracking the throttle open. Built well before modern particulate standards came into force. Passing Basham Beach. Victor Harbor is the town on the hill on the left edge of the photo. The flowers are gazanias, a native of South Africa. Drought hardy, they thrive on South Australia’s coastal dunes. Once I used to be able to keep up with the Cockle Train by car quite easily. 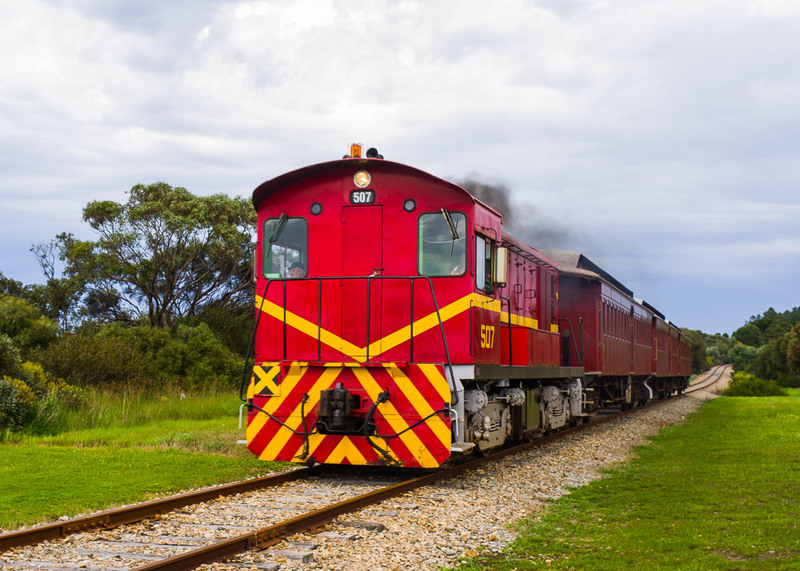 But as the south coast towns have grown and merged, keeping a car up to the pace of the train is now a challenge, even though the Cockle Train runs along at a sedate 60 km/h (35mph) or so. For this and the next few shots, the train came through almost as soon as I had stopped and got out of my car, leaving precious little time to consider how photos were going to be composed. Bustling along on the near straight run between Port Elliott and Goolwa. Smidge out of focus – I was using an old manual focus lens and the train came through before I was properly organised. I would have swapped back to an automatic focus lens if I could have just got a bit further ahead of the train. Back at Goolwa station. The trip between Goolwa and Victor takes 30 minutes each way. 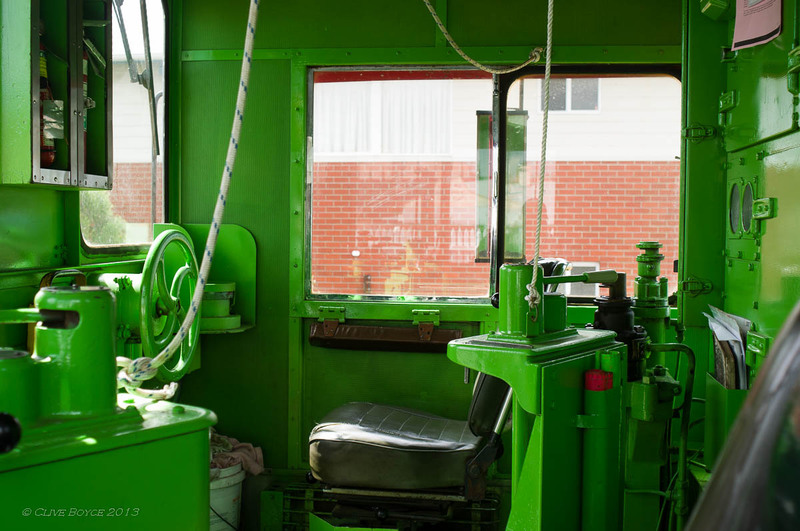 The cab interior is a lurid shade of lime green. No idea if this was the original colour scheme. There are two driving positions. The position you see here is for running rear first (the seat back would be swung over to do so). 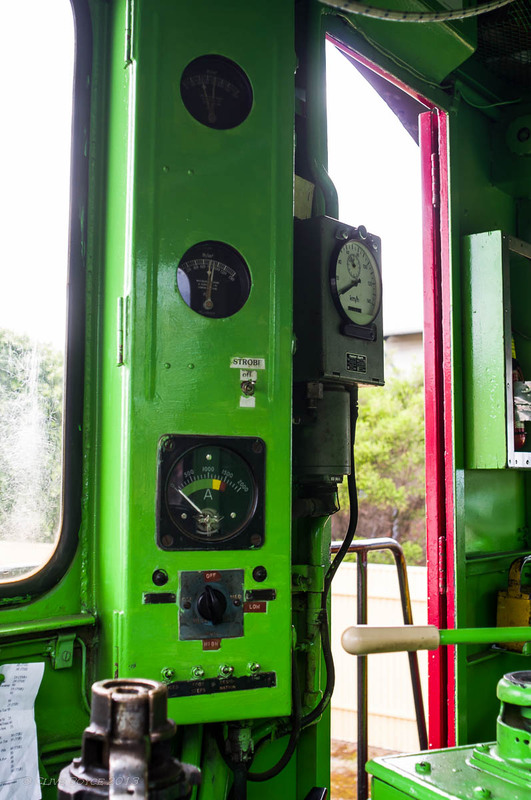 The closer position (you can just see one of the controls) is for driving when running cab forward. Ropes are to operate the horn. Not too complicated in the instrumentation department. Inside one of the wooden carriages. This one has a guards compartment at one end. That’s the end of the morning Cockle Train service. 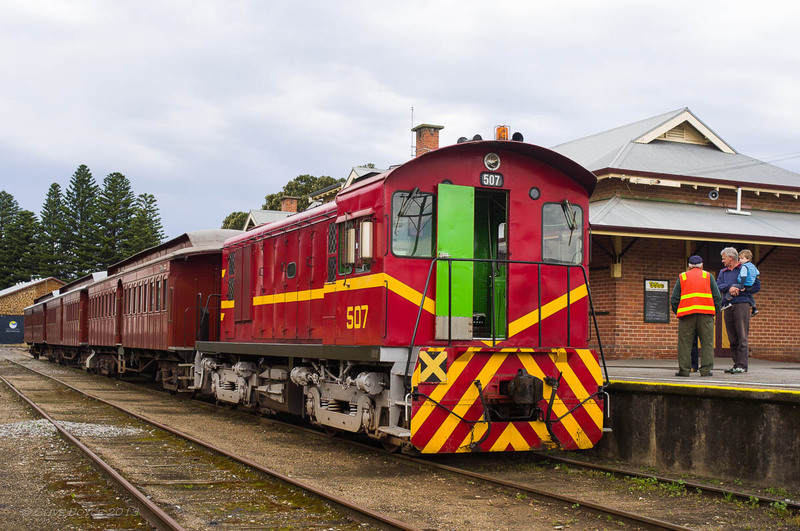 No 507 returned to the Goolwa depot, leaving the three carriages at Goolwa station waiting to be joined to the Southern Encounter steam drawn service coming down from Mt Barker to Victor Harbor. The 620 Class Duke of Edinburgh bringing the Southern Encounter service into Goolwa from Mt Barker. Goolwa port and station. This gives a good idea of the original layout. 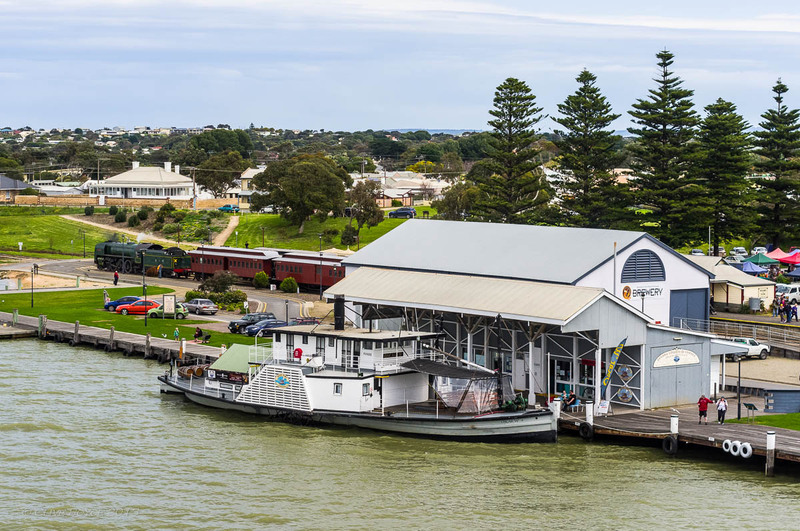 Produce from anything up to a thousand miles up the Murray-Darling river system was once brought by river boat and barge to Goolwa and then transferred across to trains for the short journey to the sea port of Victor Harbor. The river boat in the foreground is the Oscar W, built in 1908. She is a fully operational, genuine steamer. Cut river gum is her fuel. Just left of the Duke of Edinburgh is an area where a number of riverboats were constructed over a century ago. A real mix of lenses was in use during the morning. All were Pentax fixed focal length primes – the zoom lens had all been purposely left at home. 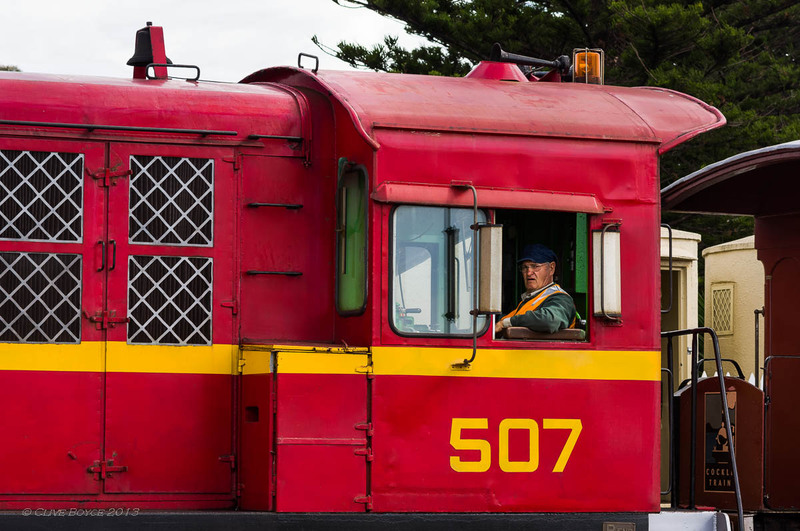 The initial shots were taken with an FA77 F1.8 Limited; the Victor Harbor station and return journey photos with an old M series 28mm F3.5 (manual focus); and back at Goolwa, a F 50mm F1.7 was brought out of the bag. 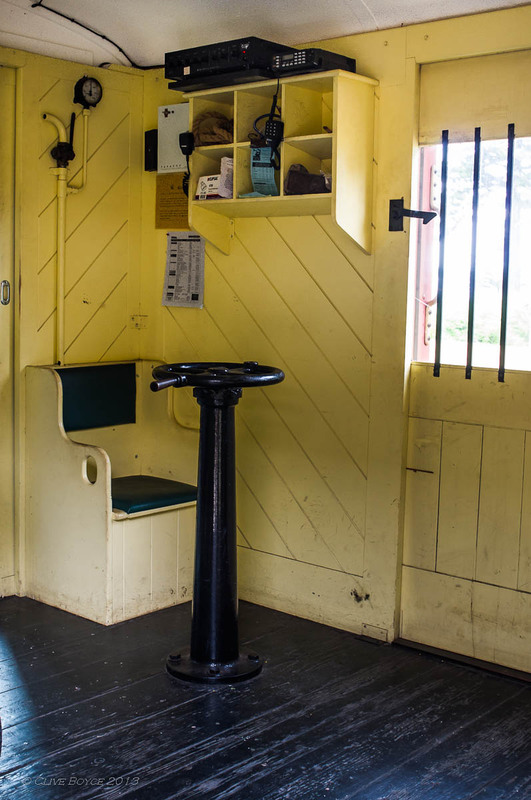 The train interior shots were also with the M28. I hadn’t used the F50 much and was pleasantly surprised at how sharp it was. Camera was the Pentax K-x as usual. More info about the SteamRanger services and rolling stock may be found here at the SteamRanger website. 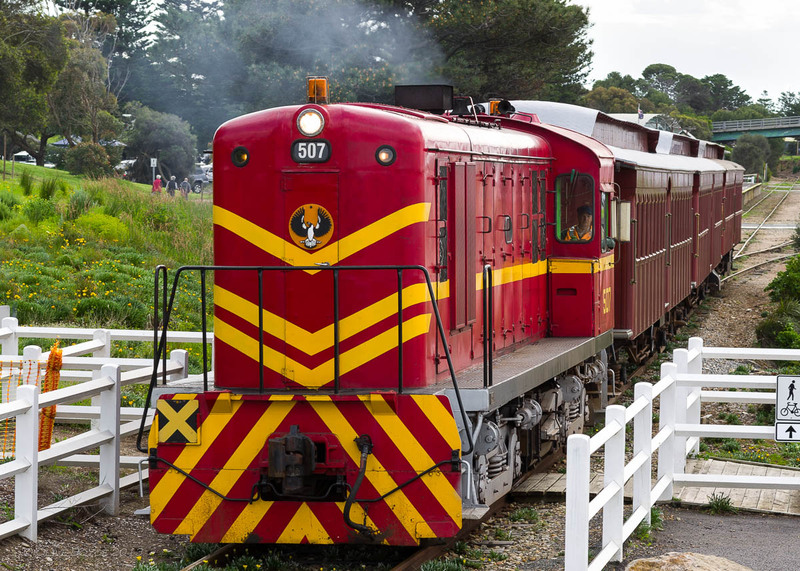 This entry was posted in Places to Visit, Regional South Australia, Trains and tagged Cockle Train, Fleurieu Peninsula, Goolwa, Historic railway, Photography, SteamRanger, tourist attraction, Victor Harbor on September 19, 2013 by aussiesouthlander.